Though the weather was less than ideal, the 115th Open Championship at Turnberry was a memorable occasion. In the winds of the first day the average score soared above 78 strokes. 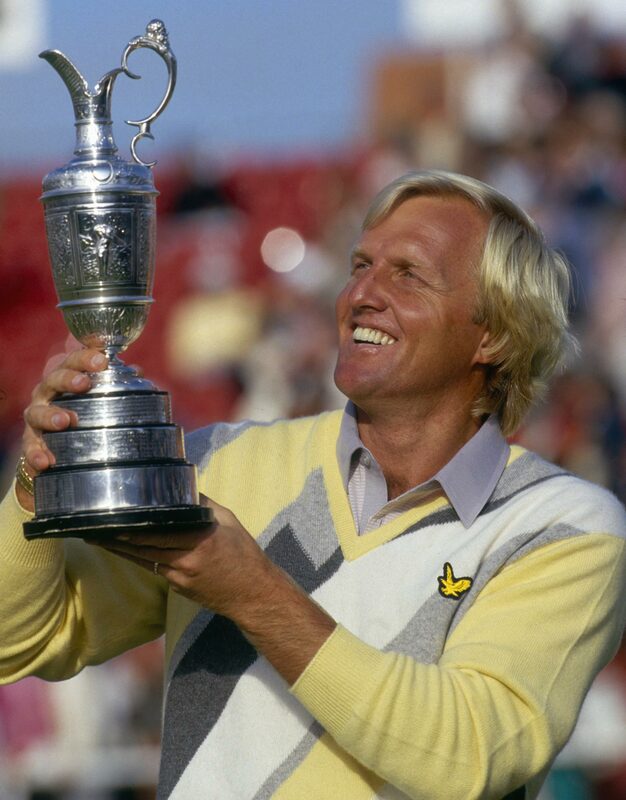 Then Greg Norman returned a 63 on the second day to equal the lowest score in Open Championship history. He held a one-stroke advantage after the rainy third round and came home five strokes clear on the marvellous fourth day when, at last, the beautiful setting of Turnberry was seen at its best. Norman: "The emotion, to me, was the greatest thrill of winning the Open because I've never before experienced it to that degree." I've never cried on a golf course before, but walking down the seventeenth and eighteenth in the final round at Turnberry, I was fighting to hold back the tears. Especially on the seventeenth. When I hit my approach in there about five or six feet, the people went crazy. That's the dominant reflection I have from winning the 115th Open Championship at Turnberry. The people. They fell in behind us during the last one hundred and fifty yards of the seventeenth and the walk to that green was just as strong an emotion as during the traditional rugby scrum on the eighteenth fairway because by that time I realised and convinced myself that the championship was mine as long as I signed the scorecard correctly. Truth be known, even when I was sitting at the presentation table waiting for them to give me the trophy, I was so scared I had done something wrong with the card. I just knew somebody was going to walk up and say, "Gee, I'm sorry, Greg, but we can't give this to you after all." I was petrified that I might have signed the card wrong or put down my nine-hole score in the box for the ninth hole. It had all been so long in coming and after all the frustrations of the near-misses in the U.S. Open and U.S. Masters, I couldn't believe I was sitting there in the champion's chair and they were going to give me the championship trophy. It was only when I had that wonderful old loving cup in my hands that I convinced myself I had truly and irrevocably won. Walking down the eighteenth was, in a word, overwhelming. To get a standing ovation in any walk of life - professor, lawyer, president, whatever - is a wonderful experience. Winning a golf championship is a wonderful thing, especially when it's the British Open, which is the true Open, the oldest championship in golf and in the country where I first won a professional tournament in Europe after venturing away from my native Australia. But the true reward is the emotions of the moment - the emotions of the spectators, of my friends, of the other players like Jack Nicklaus and Bruce Devlin and Fuzzy Zoeller and all the other people who got wrapped up in it just as much as I did. The emotion, to me, was the greatest thrill of winning the Open because I've never before experienced it to that degree. There was an air of suspicion in the days Ieading up to the Open Championship. It was too calm. Scarcely a breath of wind stirred the flags and as a fishing smack nosed slowly back towards Girvan harbour so it tore a crack, as if across a mirror. There was some talk of the rough, which was deep and tangled. There were the odd mutterings about the limited width of the fairways, between twenty-five and thirty yards, which may not be all that narrow but seems so when the fairway bends in the driving area. Generally however one had seldom heard so much praise for the conditioning of an Open Championship course. "Never better" seemed the concensus. And then, on the very eve of the championship, the weather broke. A near-gale sprang up from the south and suddenly it was a whole new ball game. Players set out for the final tuning of their games in the last practice round and gave up. Others decided not to go out at all. Some said to themselves "What the hell!" and carried on. Sandy Lyle, the defending champion, was one of them. He was worth listening to afterwards. At the eighteenth, which he had been playing with a three wood and an eight iron, he now needed two drivers. At the fifteenth, earlier perhaps a five iron to this teasing short hole, he had to hit a driver as well. At the sixteenth, where a gentle if delicately judged pitch is needed to clear Wilson's burn, he needed a one iron to be sure. At once the complaints mounted. The rough was so savage, said Greg Norman, that he and Raymond Floyd had discussed the possibility of a player injuring himself as he tried to extricate himself. Could that player then sue the Royal and Ancient for damages? He did not know but he thought it an intriguing question. Overnight the fairways had also seemed to have come down by about ten yards in width and there were broad hints that something should be done about it. Hurriedly Michael Bonallack, Secretary of the Royal and Ancient, was called for a Press conference. He was as unflappable and calm as one would expect of the most senior officer in golf's oldest institution. The Championship Committee still regarded the course to be fair. There was no point in cutting the semi-rough because it acted as a cushion in front of the thick rough and there was less point in doing anything with the thick rough because there would be no means of carting it away. And in any case the forecast was that the wind would not be as strong on the morrow. What no one wanted, least of all the R&A, was a repeat of the very variable weather suffered the year before at Royal St. George's. Then the players out on the afternoon of the first day and the morning of the second had got by far the roughest deal. Lyle had been one of the lucky ones. Often such changes of weather are dictated by the turn of the tide at high water. A telephone call to the harbourmaster at Girvan revealed that high water would be at around 8 a.m. and then again some twelve hours later. It was his opinion, as a man of the sea, that the weather, whatever it would be, would stay about the same all day. For all that there was doubt and uncertainty in many minds as Thursday dawned. It was grey, cold and windy; not quite as windy and it had also shifted to the west. Nor were the early omens any better. Ray Stewart, out in the first group at 7.30 a.m., drove into the rough, could not play it and had to take a penalty drop. Some early red figures appeared on the leader boards but they never stayed there for long. Par began to get recognition instead. Then it became the one overs. It was that sort of day. But there is always someone who gets it round and that man was Ian Woosnam, who last year had played his part in Europe's famous victory in the Ryder Cup. A chunky little Welshman with a stout heart, he played the inward half in 31 for a 70. He was the only man to match par though, realistically, it felt more like five under. Moreover it could be measured against an average score of 78.19. For a long time it had looked as if Nick Faldo, who has been trying to re-build his swing for the past twelve months with only slow success, had done the trick with a 71 that he brought in soon after lunch. But Woosnam sneaked past him in the early evening and then, as a pale sun began to dip towards the Mull of Kintyre, Gordon J. Brand, Robert Lee and one of that rising crop of young Swedish golfers, Anders Forsbrand, all came in with 71s as well. Behind them, on 72, were another five, of whom the most significant was perhaps Bernhard Langer, who had prepared for this championship as diligently as anyone. Andrew Brooks, who limits his golf these days only to Scotland, was another, together with two Americans in Ron Commans and Sam Randolph, only recently turned professional, Derrick Cooper, an Englishman, and an Australian, Ian Stanley. It had not been the most promising of days for the Americans. Gary Koch had managed a 73 and Andy Bean, Donnie Hammond and Bob Tway 74s. Hammond had in fact started sensationally, holing his second shot to the first for an eagle and following it with a birdie at the second. But it did not last and others never got going at all. Jack Nicklaus took 78 and so did Raymond Floyd, which was hardly to be expected of the American Masters and Open champions. Lyle, the defending champion, kept them company and Seve Ballesteros, the clear favourite at 7-2, could do no better than a 76. No one had talked more confidently beforehand than Greg Norman and when he went out in 35 he was doing better than most. His 39 home hurt but it was not disastrous. The odd thing about Woosnam's 70 was that there was very little sign of it for nine holes. Indeed it was the opposite when he started with bogeys at the second and third and followed with a four at the sixth, that always difficult short hole. It might even have been a five since he visited both the left rough and a bunker. There was some cheer when he pitched to twelve feet for a four at the long seventh but a hooked drive at the next led to a six and, with an outward half of 39, the Welshman's thoughts were centred very much on trying to get around in 77 or 78. He knew others were having their troubles too. Just as suddenly, things began to go right. Woosnam began to putt better. He holed from twelve feet for a three at the tenth, played the next two holes well and then saved par at the thirteenth. But it was without doubt the fourteenth, on the day the most difficult hole on the course, that made his round. At 440 yards dead into wind, it was an absolute terror. All day there were only thirty-three pars from the one hundred and fifty-three players and no one, until Woosnam, managed to reach it in two. Furthermore he holed the putt for a birdie, the only one there all day, from twenty feet. "It was," he later reflected, "the best one iron I have ever hit in my life. I had watched Hubert Green take a three wood from just behind me and he finished thirty yards short." That was the inspiration and though there was still a par to be saved at the fifteenth, from a bunker, Woosnam still had an ace card tucked up his sleeve. A drive and six iron to the seventeenth, downwind of course, left him twelve feet from the flag and in went the putt for an eagle. It was the seventh at that hole that day and against par it was the most vulnerable hole. With ninety-six birdies it came out with a playing average of 4.36. The fourteenth, conversely, averaged 5.14. Woosnam said later that he had dreamed all his life of one day leading the Open, though of course he would rather be doing it on the last day than the first. He had also come into the championship with some back trouble but a Troon osteopath, Jan Der Fries, had helped a lot and movement was getting less and less painful. It was as tough a day as Faldo had known, in the Open anyway. There was another the first day of the Amateur Championship at Hoylake in 1975, that he was convinced was worse. "Every par you got was great and every birdie fantastic," he reflected. When in the rough he took nothing bigger than an eight iron to get out, just to be on the safe side. Faldo always had his eye on the seventeenth to shore up his round but it was the birdies he also made at the sixteenth and eighteenth that made all the difference. They gave him an inward half of 33 and he got a 71 which, going out~ he had not thought possible. Brand senior, as he has to be called since there is also a junior, came next with his 71 and very neat it all was too until he took six at the fourteenth. Like many another he had to hack his way through the rough before finding an ugly stance in a bunker from which he was thankful to extricate himself the first time. Still, it did not matter too much since he finished with two birdies and, having been playing well all year, he felt confident that he could sustain his tempo, which is notable for a very deliberate pause at the top of his backswing. Then came Forsbrand, who had finished second the week before in the Car Care Plan tournament at Moortown, and finally Lee, of the 71s. Here is an engaging young man who made something of a mark at Royal St. George's in 1985 and who has gone from strength to strength since. He had two birdies and an eagle in his last six holes, the impetus having come with his birdie at the thirteenth and saving pars at the next two holes. Langer's 72 was a good solid start but he was nevertheless irritated with himself. The night before he had experimented with a new sand wedge and thought he could get more stop on the ball. So he took it out with him and at once regretted it. He left a recovery shot in a bunker at the sixth and he could not remember the last time he had done that. Altogether he felt the club had cost him at least four strokes and, had he had a long enough throw, he might well have cast it into the waters of the Firth of Clyde. Three bogeys in a row from the thirteenth had not helped either and the German described the fourteenth as "impossible"; not even two career-best drivers would have got a him home in two. But just as his round seemed to be collapsing about him, so he pitched to twelve feet at the sixteenth, struck a four iron to nine yards at the seventeenth and holed both putts, the first for a birdie and the next for e an eagle. Norman had talked as confidently before the championship began as he has ever done and fielded the inevitable questions about his having thrown away great chances in two U.S. Opens and one U.S. Masters (two of them this year) with a nice smile and a shrug as if they had not mattered at all. It was no surprise therefore to see him start with two birdies in his first three holes. This was more like it but at once he got tangled up with the long grass to the left of the sixth fairway, careered across to the other side and I ended up taking three putts for a six. Normality returned and level par to the turn was good going. But he made silly mistakes at the eleventh and twelfth, the latter of which led to another double bogey, due in the end to another three putts. There were times when he felt utterly humiliated by the weather. "We were reduced 1 almost to nonentities, hacking along and tryring not to take more than five at a par four," he said. There was a 74 too from Tsuneyuki (Tommy) Nakajima, who was later to play central part in the championship, but this was a day that made many a giant wilt at the knees. Nicklaus was one. He was rather down in the dumps when he took three putts on each of the first; two greens but he steadied and was no worse off as he came off the eighth green. But then came a quite disasterous run as he stumbled into five successive bogeys, immediately followed by a double-bogey six at the fourteenth and then another at the sixteenth, where he was in Wilson's burn. A score in the 80s therefore beckoned until, with a late flourish he managed to eagle at the sevenr teenth and birdie at the eighteenth. If such a finish was reminiscent of that marvellous confrontation between Nicklaus and Watson in 1977, that was about all. Nicklaus was already calling it a "survival tournament", (Americans are generally quite unable to distinguish between a championship and a tournament) and there was nothing from Watson to suggest that he was being motivated by a return to the scene of one of his most famous triumphs. He took 77 and, as has been the case more than once in his career, it was largely a case of bad driving and an equally indifferent short game. Such is hardly the best of combinations. Watson maintained that the fairways were too narrow and the cross wind made them even harder to find. On reflection he felt that he had used his driver too often but learned from Brand, who used his more sparingly. The American's putting also disappointed him. If it had been better it could have been a 73, he thought; but how many golfers do not come in thinking that? Floyd's 78 included an eight at the fourteenth and he could not remember the last time he had had one of those. The gorse bushes to the right of the fairway were quite magnetic to a number of players and when Floyd drove into them, he received a cheerful wave from some spectators that his ball had been found. In fact it was not his. Nor were three others unearthed in the same area. So back he went on the lonely trudge to the tee and proceeded to take six with his second ball. The American champion described the conditions as bad as anything he had experienced and Ballesteros was not very happy either after his 76. What upset the Spaniard particularly was the lamentably sluggish speed of play. He claimed that it had taken him five and a half hours to get round and that, he complained, was ridiculous. "When it is cold and windy and you have to wait, it is impossible," Ballesteros said. "We spent half an hour standing on the sixth tee," though there may well have been some exageration in that. The point he did make, which was a valid one, was that too many players are not ready to play when it is their turn. Too many players do stand around watching their partners and only "wake up" as it were after they have hit. But the early days of an Open Championship are not only about leaders. They are also about dreams and shattered dreams. Into such a category fell Andrew Broadway. He had only been a professional for six months and this was his first Open. He had qualified most respectably at Western Gailes with two 70s. Unfortunately, however, he was suffering from some back twinges and had fixed an appointment with a physiotherapist after his round. A consoling shoulder might have been of more help, for Broadway, 25, from Peacehaven in Sussex, had found no haven of peace in the Turnberry winds. By the tenth hole he had asked Bruce Zabriski, one of his partners, to stop marking his card. It was getting altogether too embarrassing. A succession of early bogeys were disappointing more than alarming. But then came a five at the short (supposedly short!) sixth and, much, much worse, a ten at the seventh when he began to wonder whether he might ever emerge from the rough. Out in 49 was bad enough but when Broadway then followed with an eight at the tenth, it was altogether too much. "Tear it up," he instructed Zabriski, but he could not resist playing on, just for the fun of it. In fact he played a bit better and at least he had the experience of coming to the eighteenth and a round of applause from the grandstands. All that was missing was his name on the scoreboard. It had been taken down. Recap courtesy of Michael Williams. The memories of the world's best golfers and the ways of nature are equally fickle. In certain stressful situations they can make a volatile brew. So when Turnberry mixed the two, and did the stirring with a thirty miles-an-hour wind, trouble was inevitable. Greg Norman, the eventual winner, rated the result an intimidating, humiliating, hacking, brutal experience. He heard no arguments from the other one hundred and fifty-two challengers who toiled to limit their torture to just 1,251 shots over par for this first day of the 115th Open Championship. They were content to survive as their recollections of the course from nine years before suffered a variety of violent deaths. Turnberry, 1977, inspired a great many misconceptions. As a newcomer to the Open rota Turnberry gained immediate immortality by producing one of the greatest, perhaps the greatest, championship of all time. Tom Watson, the winner at twelve under par, and Jack Nicklaus, second by a shot, had stretched an incredible duel to the extent of matching birdies at the seventy-second hole. The winning total of 268 set a record, as did the secondround 63 by Mark Hayes. As time passed, memories pigeon-holed Turnberry as a lowscoring venue. How wrong can you be! Turnberry made its Open debut in a drought and the rough was so sparse that even the rabbits moved away. The wind came from the less-troublesome north-east, and by Ayrshire coast standards, rarely got above the strength of a breeze. Yet only Watson, Nicklaus and Hubert Green, a faraway third on 279, finished under par. The signs were all there to heed for the return of the Open, but the world's best golfers only like to remember the good things in life. It's part of the religion they call Positive Thinking. One look at Turnberry, 1986, was enough to jolt them back to reality. The rough was so thick and tall that the rabbits must have had awful trouble finding their way back home. The Championship Committee narrowed the fairways sufficiently to revive Lee Trevino's joke about the need to walk in single file. And, slowly but surely through the practice days, the wind mounted. In the final hours before the real action it became strong enough for Trevino to make a prophetic prediction. Scores of 80 or worse were possible, he thought, if the wind persisted. It did persist and he was among the forty-seven first-round players to take 80 or more. Norman ranked Turnberry as "probably the toughest golf course I have played for any championship." But Norman insisted that he liked the course, the tougher the better, and he hoped the wind would blow for at least two or three days. He got his wish. Setting up a championship course is often a thankless task. Among one hundred and fifty-three players there will always be those who think the greens are too fast, those who condemn them as too slow, and others who will be critical of the narrow, wide, hard, soft fairways. Turnberry was no exception. Michael Bonallack, who mastered Turnberry well enough to make it the scene of the first of his own five Amateur Championship wins, answered for the Royal and Ancient: "Setting up a course, particularly in this country, is something fairly imprecise. You don't really say how long the rough should be because that is under the control of nature. It's not unfair. But it will be difficult. They will have to play with their heads." And with that advice, unsolicited and therefore within the rules, he stood aside for the Open to start. The first round began at 7.30 a.m., finished close to 10 p.m., suffered a westerly wind, the most demanding, gusting up to thirty-five miles an hour, and favourite Severiano Ballesteros was made doubly unhappy by his sixover-par 76 having taken over five hours to complete. Everybody seemed to be searching everywhere for golf balls lost in the rough. Some, like the one U.S. Open champion Raymond Floyd hit at the 440-yards fourteenth, were never found. It cost him a quadruple-bogey eight and score of 78. More unfortunate on the same hole was former U.S. Masters winner Craig Stadler. The wrist he damaged playing a recovery shot became so painful that he withdrew after shooting 82. To add to the general grief, it was bitterly cold. On the tee at 8.30 a.m. to endure the worst of the conditions, Norman looked more massive than usual in layers of protective clothing that included thermal underwear and a couple of cashmere sweaters. Oh, to be in Scotland now that summer is here, they tried to whistle through gritted teeth. More audible were the cries of anguish as the pain of chilled fingers on the tee, strained wrists in the knee-high rough, and, most of all, wounded pride everywhere, replaced the favoured memories of a sun-blessed Turnberry from 1977. Golf this day, decreed Nicklaus with all the authority of his twenty major championships, had become a game of survival. But there was nothing wrong with that, he opined. The course was the same for them all. Others, choosing to ignore this paramount fact, shifted their arguments about it being unfair on to the shoulders of the spectator. It wasn't the kind of golf he wanted to see for his money, they suggested. What a joke. Since when did the average tournament professional care tuppence for Joe Public? To put that thought to the test and a swift death just propose that he be given full value for his gate money by being allowed inside the ropes, back on the fairways along with the television cameras and boom microphones. Norman called the day an intimidating, humiliating, hacking, brutal experience. Fortunately, the hysterics were tempered by sufficient voices of reason. The understanding and maturity of Floyd stood out. He could easily have bleated about losing a ball at the fourteenth, where the head-on wind had the green out of reach in two shots for a lot of the day. Instead, he took his punishment, joking about how he found four golf balls lost by others. " Any time I was in the rough it was penal. In the situation, a championship, wind, cold, these are the hardest conditions I have ever played in. Unfortunate, but that's the way it is." Floyd's exemplary, sporting acceptance of a cruel day stretched to the point of refusing a proferred excuse. What was the real par for the course he was asked at his post-78 conference? "The card says 70 and 70 is what it is for me and the rest," Floyd insisted. He is a good ambassador. Floyd recognised and put into perspective what a championship is all about. It certainly isn't about target. golf, pitch-and-putt stuff with mile-wide fairways and greens given the monsoon treatment every night. The Open Championship has to be the ultimate challenge of talent, mental capacity for the game, resolution and adaptabilityWhen a thirty-five-milesan-hour wind is howling up, down or across a twenty-four-yards fairway bordered by more hay than some farmers see at harvest time, then trying to read a yardage chart through eyes wet and running from the cold has to be nonsense. It's all "feel" sensing that a seven iron is sufficient to cover 209 yards downwind, and having the confidence to use it. Norman did at the short fifteenth, on the way to his starting 74 alongside Floyd in the worst of the early morning weather. "A very brutal day for golf," was his verdict with the thoughtful rider: "You can feel a non-entity out there, hacking around the rough, shooting a 74 that feels like a 64 at the finish." The strength of the wind made it always extremely difficult to control the ball, close to impossible at times, and as a result some of the best players in the world were being humiliated. It didn't matter whether you were a good tournament professional, an amateur or just a week-end hacker, you have to know where the ball is going, he said. And at cruel Turnberry this day, they couldn't be sure. The conditions created guesswork. "Today was the kind of day when you walk off the course with a headache from concentrating and fighting the wind." But the Open Championship is meant to be about mastering tough courses, humps and hollows, rough thick enough to punish, wind and rain. It is supposed to be an examination for all fourteen clubs in the bag while placing equal demands on power and finesse. Headaches are the rewards for refusing to surrender and cry about the unfairness of it all. There are hundreds of "Have Fun at Happy Valley" tournaments. The Open is different. It has to be, and Norman accepted this to become champion. The Open Championship never produces an unworthy or bad champion, a compliment that bears any amount of scrutiny. At the outset each year the object is simple enough: to create a golf course and attendant circumstances which will allow and encourage the best player in the field to win the title. The Royal and Ancient Championship Committee, whose powers of forceful authority and gentle persuasion bow only to the whims of nature, has been incredibly successful in this respect. Golf has no greater record for sheer consistency. The start of the 1986 Open saw Ballesteros, Bernhard Langer and Norman being recognised by the Sony Ranking as the top three golfers in the world. It was therefore as much a victory for the R&A as it was for them that they finished in the top six. Once again the objective had been achieved. Along the way, however, there had been a multitude of suffering. The computerised scoreboards worked almost as hard as the players to keep pace with the bogeys, double bogeys and worse -1,224 in all. The worst disasters came at the fourteenth, where Stadler moved his recovery shot in the rough no more than a few inches, Floyd found every ball but his own, and the average score for one hundred and fifty-two players one quit before he got there was an astounding 5.14 against a par of four. The mayhem on this hole amounted to one hundred and eighteen bogeys and worse. One solitary birdie, a drive, one iron and putt of twenty feet, belonged to Ian Woosnam, and it swept him to the first day lead. The 222-yards sixth was almost as fearsome. Against the wind it frequently called for a driver. An average score of 3.80 resulted as ninety-eight players failed to make par. So much for memories of Turnberry in the sun and low scores. Langer, heading for his third successive top-three Open finish, included a double-bogey five at the sixth in his 72. "I am delighted; it could have been a lot worse," he said. How wise, how true. The severity level adopted for the setting up of an Open course will always be a contentious issue. Given that only some twenty players approach it with a chance of winning in the first place, the vast majority have grounds to object. They naturally command a more sympathetic hearing when the weather turns so foul that the scoring average soars to 78.19 against a par of 70. But does that justify pleas for the R&A to rush out and widen the fairways to reduce the brutality, the hacking, the intimidation and the humiliation of it all? Heaven forbid. The Open is meant to separate the wheat from the chaff without any waste of time. Certainly, those who would have had this done wore egg on their faces the second day when on an untouched course Norman scored 63, only a rush of blood and three putts on the home green denying him another record. Until such times as the Royal and Ancient finds a way to control the weather, some days will be fairer than others. In the meantime there will always be those, like Ian Woosnam the first day of the 115th Open Championship, ready to prove that there is a way to conquer no matter what. And, be assured, the last day will always produce a true champion to satisfy the fickle memories of the world's best golfers and the capricious ways of nature. Commentary courtesy of Mark Wilson. No one had spoken more confidently before the championship began than Greg Norman. He had come to Turnberry having taken a two week holiday which he most certainly could afford since he was leader of the United States money list with already three tournament wins under his belt. To Norman, an Australian now living in Orlando, Florida, this was assuming ever greater importance for no man had ever in different years been top money winner in Australia (more than once), Europe (1982) and America. It was therefore all the more perplexing that he had still not won a major championship, though in all conscience he had had the opportunity. Nor was he allowed to forget, by an often merciless American media, that he had "collapsed" in a play-off for the 1984 U.S. Open, "choked" in the Masters when he had a chance of catching Jack Nicklaus and "blown" another U.S. Open only a month before when he failed to hold on to a one-stroke lead going into the final round. Maybe because he is so used to them, Norman rides these barbs with an easy manner and a flashing smile. In fact he is ideal media material for if he cannot come up with something of interest when being quizzed, he will invent it. Once, when playing in the European Open at Sunningdale, he blamed a topped drive on a worm which popped its head out of the. ground beside his ball just as he was commencing his downswing. I am not even sure that he did not say it winked as well! For all that Norman still had to be taken as a serious contender. By chance I had watched him playa few holes of practice. Everything seemed to be going plumb centre and when he conceded that he was playing "pretty good," there was no need to question it. Norman had consulted Bruce Devlin, a fellow Australian who knows his game backwards, and had got the "go ahead." All Devlin checks in Norman is his ball position at the address for it does have a tendency to move either too far forward or, again, too far back. It was, it seems, perfect. And so was his golf on this second day of the championship for as the wind eased so Norman, the Great White Shark as he is known in some quarters, bared his teeth and tore a 63 from the Ailsa course. It was not the first time such a score had been returned in an Open Championship but only two men had ever done it before: Mark Hayes here at Turnberry in 1977 and then by the Japanese player, Isao Aoki, at Muirfield in 1980. Norman was therefore into the record books, though he should have re-written them. Needing a par four at the last for a 62 and a new landmark in the history of the Open, he took three putts. After all the trials and tribulations of the first day, when only Ian Woosnam matched par, it was almost ridiculous that Turnberry should yield such a score. It was still not that much of an easier day. In a field of now one hundred and fifty-one (Andrew Broadway pulled out and Craig Stadler reported injured with a damaged wrist), only fifteen players still managed to score in the 60s. Ten of them moreover had 69s, the next best to Norman being 67s from Raymond Floyd and Tsuneyuki (Tommy) Nakajima. So it was Norman who hoisted himself to the top of the leader board, his 63, which was an eleven-stroke improvement on his opening round, making him three under par for the championship. It gave him a two-stroke lead from Gordon J. Brand, otherwise known as Brand senior, who played with splendid composure for a 68. On 139, Brand was the only other player under par. Four strokes behind Norman came Nakajima after his 67 and Nick Faldo (70), followed by Bernhard Langer (70) another stroke away on 142 and then, on 144, a group of four Jose Maria Canizares, of Spain, Anders Forsbrand, of Sweden, Greg Turner, of New Zealand and Ian Woosnam, the overnight leader who had fallen back with a 74. There was therefore not a single American in the top nine. What q contrast that was to 1977 when the leading eight at the end of the championship were all American and eleven out of the top twelve. Best placed now were Floyd, whose 67 had advanced him from equal seventy-first to equal tenth, Donnie Hammond, Gary Koch, Payne Stewart, Bob Tway and D.A. Weibring, all tied on 145 with Andrew Brooks, Roger Chapman, and an Australian, Ossie Moore. But the thirty six-hole cut was not without its casualties and nearly some very famous ones. The guillotine had fallen on 151 and right on that borderline were such notables as Sandy Lyle, the defending champion who had scraped home with a second round of 73, Seve Ballesteros, the favourite with another rather disappointing 75, and Jack Nicklaus, who made it only by dint of an eagle-three at the seventeenth on the way to a 73. But out went Peter Jacobsen, the usually very consistent Tom Kite, former champions Johnny Miller and Bill Rogers, and Scott Verplank. All these Americans missed by a stroke while others who had to make an early departure were Deane Beman, who had otherwise come out of retirement with a fair degree of success, Joey Sindelar, Mark Mouland, winner of the Car Care Plan tournament the previous week, and four European Ryder Cup players in Howard Clark, Paul Way, Jose Rivero and Ken Brown. Turnberry had indeed taken its toll. This second day nevertheless belonged to one man and one man alone: Norman. He had in fact been a little concerned that the strong winds of Thursday might have affected his rhythm. It can happen. But from the very outset his set-up was right and his tempo, to use his own description, "fabulous." He said later that every time he stood over the ball "I knew the clubhead was going into the perfect position." Yet he felt that the course had "played tough." There was still enough wind around, particularly for nine holes or so, to make the fairways quite difficult to find, but therein lay the key to making birdies. Only on the inward half did opportunity really beckon and it was then that he took advantage. Yet the signs had been there much earlier. A straight-forward par at the first where, because of the angled fairway he settled for a four iron off the tee, was followed by three successive birdies. Norman hit a drive and eight iron to eighteen feet at the second, a drive and six iron to five feet at the third and then another six iron even closer at the short fourth. Each time single putts found the mark. There was a slight lapse at the fifth, which consistently proved one of the more difficult holes, having been lengthened to 441 yards. Norman was marginally short with a five iron second and took three putts, albeit from thirty yards or so. But he made up for it almost immediately with an eagle-three at the seventh. A drive and one iron fairly whistled up the long, narrow gully and in went the putt, this time from around twenty feet. Disappointingly he was then short again with a five iron to the eighth but despite a second dropped shot was still out in 32 and right back in contention. At once came a drive and six iron to five feet at the tenth, a nine iron almost stone dead at the eleventh and those two birdies hoisted red figures beside his name on the leader boards for the first time. All eyes were on him now and when Norman then moved to six under par for the round with a three at the fourteenth, where this time a three iron came to rest not a yard from the flag, the crowds seemed to converge on him from all directions. Norman has long been a popular figure in Europe, it being here that he first began to expand as a world-class player. When at the sixteenth he pitched an eight iron beyond Wilson's bum to six feet or so and bottled that putt as well to go seven under, anything seemed possible. An eagle-birdie finish, which had to be "on" with the seventeenth such a vulnerable par five, would put him round in 60. Nor did that possibility immediately diminish, as at the seventeenth Norman launched into a drive and then a five iron to lie eighteen feet away, with that putt for the eagle. The whole golf course seemed to come to a halt, holding its breath in expectation, but the ball slid by. For all that it was still a four at eighteen for a 62 or, for that matter, a birdie for a 61. It was totally unpredictable that he should manage neither. A two iron and seven iron to nine yards or so gave him a chance but the first putt was strong, the one back wide and that was a bogey-five and a 63. Norman said that he did not know a 62 would have broken the championship record. All he was thinking on the eighteenth green was not leaving his first putt short. He simply mis-read the speed of the green, failing to notice the gradient on past the hole. When he had seen how close he was at seventeen, he was thinking very much in terms of a 60. The first man into the interview tent that day was Jose Maria Olazabal, a young Spaniard who has been making quite a name for himself in his first season on the European circuit. It was not however his 69 that was a matter of attention, but a presentation by Alastair Low, Chairman of the Championship Committee, to recognise Olazabal's unique distinction as an amateur when he won the British Boys, Youths and Amateur championships. Last year he had also been leading amateur in the Open at Royal St. George's, but this time the medal remained in its wrapper since no amateur qualified for the last two rounds. A more significant appearance seemed at the time to be that of Langer, whose 70 had seemed enough to put him right up near the top of the leaderboard, since Norman was only just getting on his way. Langer even speculated that he could be leading at the end of the day and indeed it was more than another hour before Nakajima overtook him. Langer had what he described as a rather "sleepy" start it was soon after 8 a.m. that he drove off and he dropped strokes at two of his first three holes. He missed the green at both the first and third. However the West German quickly settled with no further mishaps to the turn. And then, with two substantial putts at the tenth and thirteenth, he pulled back both those lost shots and, with the seventeenth to come, was looking for a round in the 60s. It was an intense disappointment to him that he failed. From a good drive, Langer could not make up his mind whether to hit a three iron or a one iron for his second. The lie was slightly uphill and at length he went for the bigger club, hoping to cut his ball into the green. But it was a poor shot, well to the right of the green and though he was still able to putt, he misjudged an intervening mound and barely made the front of the green. "1 felt very bad," said Langer. "It is the easiest hole on the course." Payne Stewart, who was runner-up a year ago at Sandwich, eighth in this year's U.S. Masters and then fourth in the U.S. Open at Shinnecock Hills, was well satisfied with his 69 for a total of 145. His most prophetic statement was that even par was going to be a good score and could even win. Having gone out in 33, Stewart dropped three shots at the tenth, fourteenth and fifteenth, but he did manage to eagle the seventeenth and hoped that at the end of the day he might be only four or five strokes behind. However the first of the real fireworks came from Nakajima, who scarcely looks a golfer with his glasses and rather drooping shoulders. His record in Japan, where he has won more than £2 million and is rapidly becoming as famous as Jumbo Ozaki and Isao Aoki, belies all that. Nor is he exactly unknown beyond those shores, though his principal claim to fame has come with the thirteen he once took at the thirteenth in the Masters and a nine he had at the Road hole in the 1978 Open at St. Andrews. There he was on the green in two but putted into the horrid little Road bunker and took four to get out. No such disaster overtook him in this second round at Turnberry. Far from it. Nakajima came home in 30 for his 67 and, beginning at the ninth, he had nine single putts in a row. That provided a transformation, for there was not much sign of a score in the 60s when he went through the turn in 37. But then came a whole flood of birdies: a two at the eleventh, a three at the next and then a run of two, three, four from the fifteenth with not one of them putts of less than ten feet. In between there had been a pretty good "save" at the thirteenth as well. Talk about some Oriental magic with the putter! It was the first time in a major championship that Nakajima had got himself into such serious contention and, in very passable English, he said that half of Japan would be sitting up the following night to watch him in the third round. His lead on 141 for the 36 holes was nevertheless short-lived. Hard on his heels came the elder Brand with a 68 for 139, the only man so far under par, though Norman was still to come. For someone whose best finish of the year had been fifth in the Carrolls Irish Open, this was something of a surprise, if less so to Brand himself. He had, he said, been playing well all season and he did not take fright when he got away to another good start with two birdies in his first six holes. All through his rhythm was good and his very noticeable pause at the top of the backswing remained uninterrupted. Both of those two early birdies were the result of good shots to the green rather than putting and his two iron to the sixth, which came to rest not much more than a yard from the flag, was the one that gave him the greatest satisfaction. Later there was another birdie at the tenth; either side of which he admittedly lapsed into bogeys at the eighth and thirteenth, but the momentum was maintained through to the seventeenth where, from a sidehill lie in the rough, he struck a majestic metal spoon to the heart of the green for the last of his birdies. Brand deliberately avoided looking at leaderboards while another key to his performance lay in his restricted use of the driver. It was not until the seventh that he pulled the cover off it and altogether he used it only five times. He was surprised how much Tom Watson had used his and was not surprised how often it led him into trouble. Watson, with a 71 for 148, was clearly losing touch with the pacemakers. Woosnam felt that his 74 was hardly a disaster, but admitted that he had not struck the ball anything like as well as he had in the first round. It took him seventeen holes before he managed ~ birdie and by then he had dropped five shots, two of them at the eighth. Bogeys at the fifteenth and seventeenth were due to his taking three putts. More cheering news from a British point of view was a 70 from Nick Faldo, one stroke better than on Thursday. Out in 36 with a six at the seventh, he got the stroke back with a birdie at the 11 th only to drop strokes at both 'the twelfth and sixteenth, where he hit a pitching wedge into the burn. A twenty-foot putt saved his five and encouraged him sufficiently to hole another long putt for an eagle at the seventeenth. The weakest part of his game, he felt, was his driving and instead he had resorted to the one iron for much of the time. As only five players have ever won the British and U.S. Opens in the same yearBobby Jones, Gene Sarazen, Ben Hogan, Lee Trevino and Tom Watson it was good to see Floyd coming back with a 67. He did it in the company of Norman, which may have meant that not too many people noticed. But he generously said that it had been contagious to play with the Australian when in full flight. Lyle, relieved at least to have qualified for the last two days, admitted that his golf had been scrappy but he did not regret having taken off the two weeks leading up to the Open. He was happier with his swing but felt it was proving a difficult course to attack. Nicklaus was even more disappointed, hitting too many bad shots and then missing too many short putts. Langer observed that Nicklaus was catching the ball rather "fat" and leaving himself short too often. Ballesteros was not a happy man either. Nothing was right, he said: his driving, irons, chipping or putting. The only way he could think of improving was to change his head. "But you never know, two 65s in the next two days," he mused. Even he could have had little idea how close that would have come. Few had enjoyed the first day at Turnberry. The course was set up tough for normal conditions, far less a cold, biting wind and heavy rain. The professionals had suffered and the local paper had shown a picture of Greg Norman sitting head in his hands, with the caption "Don't cry, Greg." The thirty-one-year-old Australian certainly was not crying. He had shot a 74, four off the lead on a day when no one broke par and only Ian Woosnam matched it, but he was happy with the way he played. Far from being despondent, he was really quite elated at the way things had gone. He had hit the ball well. His concentration had been good in difficult situations. He is not a negative person and his positive attitude on Thursday evening helped him take the first tee on the second day in just the right mood to let Turnberry have its own back. His performance was a knock out. His 63 was just one stroke away from being the most historic round in any major championship. Greg is one of the elite few on the international scene who is capable of producing electrifying scoring bursts. On every circuit in Japan, Australia, Europe and America there are dozens of golfers grinding out a living with hard-worked-for scores of one, two or three under par. Greg goes for far more dramatic sub-par numbers. It is an ambition of his to shoot a 59 one day somewhere and I am not prepared to bet against his achieving it. When he was playing in the European Open at magnificent 5unningdale a few years ago, he announced that because the course was playing shorter than normal, he hoped to break 60 on it. Many scoffed and chortled at his apparent big-headedness. In fact he was not joking. He meant what he said. He did not achieve it that time but he tried really hard to match his words. What is it that distinguishes the really low scorer from his rivals in the world of professional golf? Well, initially no golfer is going to rip a course apart if he has not got supreme confidence in his game, a fiercely positive approach, built-in power and, above all, no fear. Greg Norman admits the game does not scare him. His motto might well be "Live by the sword, die by the sword." He goes for the flag almost every time. He explains his attitude this way: "I only look at the pin. I know the yardage I've got to hit and know that I can usually hit within six feet of the hole with pitching clubs. There may be a cluster of bunkers guarding the entrance to the green on the left and a water hazard along the right side of the green, but they do not figure in my thinking. If I let them interfere I'd start getting scared, apprehensive, defensive. 50 I block them out. Other people might find it difficult to do that. I'm lucky I don't." Basically Norman does not have much fear in anything he does. He has flown and enjoyed co-piloting an F-16 American Air Force jet; he enjoys travelling fast in his Ferrari or Rolls Royce Cornicha or XJS-6, but he is always quick to point out he never pushes himself beyond what he believes are his capabilities. It has been the same for him on the golf course, right from the day as a young amateur at Royal Queensland he shot a thirteen-underpar 60. That was not in a competition but it gave an indication of what young Norman might achieve later in his pro career. He was a late starter in the game. He did not get his first full set of clubs until he was nearly sixteen. That was in 1970 and he remembers the clubs cost his parents one hundred and fifty Australian dollars. At that time he played off twenty-seven. Within nine months, he had won his first golf event playing with his dad, and in less than two years, he was down to scratch and very quickly picking up the Queensland Junior Championship. Even then he was a big hitter. His early coaches encouraged him to hit full out, believing it was easier to build in control and accuracy later, than to perfect a controlled game first, then try to add in the power. They were right. Now his average drive on tour is over two hundred and seventy-four yards and he always has something in reserve. This helps considerably when it comes to overpowering the par-five holes. . . and his low rounds usually include one or more eagles. "My caddie, Pete Bender, always says that the key to a low scoring round is playing the par-fives well," says Greg, who recalls one time at the famous Wentworth course near London eagling three of the par-five holes and being mad at not eagling the other after hitting the green in two shots. "That annoyed me," he said. Norman, like Fuzzy Zoeller when he gets it going (he once made eight birdies in a row in 1976) or like Europe's Jose-Maria Canizares, who ended the second round of the Swiss Open in 1978 with five birdies in a row and started the third with six birdies and then an eagle, is not short on adrenalin when required. In 1977, for instance, when he first arrived in Europe, he turned up at Blairgowrie in picturesque Perthshire to play the stylish Martini tournament (sadly no longer on the calendar). It looked as if Howard Clark, the Ryder Cup golfer, was going to win until Norman, in driving rain, birdied five holes out of six from the turn, stormed home in 32 for a course record 66, and picked up the first prize cheque. In Australia in 1978 he shot a closing round of 61 in the Lakes Open to come from six strokes behind and win by three. Ian Stanley was his victim that day. He has shot a 62 at Las Vegas and in the Canadian Open at Jack Nicklaus' tough Glen Abbey course and he has had a 62 on what could be described as his home course these days Bay Hill, in Orlando, Florida. He lives on the complex developed by Arnold Palmer, with whom he often practices. "I really did have a chance that day at Bay Hill to shoot 59," he recalls. "I was nine under par after fourteen and lipped out for birdies at the last four holes." That he remembers, but most of his low scoring performances he has long forgotten. "Basically I'm not a record hunter," he says. Power off the tee he most certainly has the result, perhaps, of the fact that like Seve Ballesteros and Gary Player he has arms one inch longer than normal. He can build up a longer, wider arc and generate more power. He has broad shoulders and strong thigh muscles to help drive his legs through the shot. Although for over a year he was hampered by having caught an at-first untraceable virus in Hong Kong, Norman is incredibly fit and strong, even if he will not be able, according to his great friend Jack Nicklaus, to keep hitting the ball with such venom for much longer. Norman's longest drive by the way was one of 484 yards at the eighteenth at Gleneagles in Scotland. It was downhill and downwind, but still a monster shot. He finished just a yard or so from the green and eagled the hole to win his match in one of the BBC pro-celebrity encounters. (The following day Tom Watson, not to be outdone, hit his drive at the same hole a couple of yards further). Norman's short game these days is sharper than it has ever been. He putts boldly, sometimes too boldly for the hole, but is good on the greens. Yet all that plus an ability to hit crisp irons into the green is not enough to make a golfer a regular low scorer. He needs that aggressive attitude and you might think that Greg inherited that from his parents. In fact, in the early days, Norman's off-course personality was painfully quiet. "I used to be very shy. I never used to talk. When I won my first pro event, (only the fourth tournament he had ever played in) I was drawn the following week with Nicklaus, my life-long hero. My whole game was modelled on his technique learned from poring over Golf My Way but I was dreadfully nervous. We met and chatted briefly the day before. He did most of the talking. When it came time to tee up, I topped my opening drive thirty yards and finished up shooting an 80. In those days I used to answer Press questions with a "yes" or "no", but I realised this was silly. I appreciated very quickly that if you can relate to people, and them to you, then that is the whole deal right there. Now I speak my mind and if I'm irritated by a question in the press room I am inclined to let the man who asked it have it if he deserves it." Greg has certainly conquered his shyness! What he has not quite mastered yet is the necessity at times to throttle back, pull in the reins. If he is in the mood for a low score and that is something that just seems to happen on the day his natural approach is to go for it all the time, when some times a little conservatism might be a more prudent policy. Yet spectators love it when he is chasing the birdies and eagles with relentless enthusiasm, like he did on the second day at Turnberry. His 63 included an eagle and eight birdies. He dropped three shots, made only six pars, and thrilled the huge crowd that followed him as he proved that Turnberry could be mastered. "I felt good when I got up that morning. The weather was better. On the way to the first tee I kept saying over and over in my mind 'Blue skies and a 65.' I say that often to myself to get myself going and I moved into top gear quickly. I birdied three of the first four holes. Everything seemed to flow," recalled Norman afterwards. "The ball was coming off the middle of the club and I felt really confident and comfortable with my swing. I liked the speed of the greens. That suited me, too. There were no distractions. I was totally involved in each shot and that is when I am at my most dangerous. That day everything seemed just right." The crowd were quickly behind him. Any gallery loves a golfer making birdies with the ease others are making pars. Norman, on the second day at Turnberry, reminded some of us of]ohnny Miller in 1974 when in back-to-back weeks in the Arizona desert he shot twentyfour under par and twenty-five under par respectively at Phoenix and Tucson. Miller played, then, as if in a trance and Norman, blessed with the same low scoring ability to shoot lights out when "in the mood," was in spectacular form as he chased his first major title. The driver is his favourite club in the bag, but many golfers, fearful of ending up in the punishing rough, were using irons off the tee or three woods. Norman, crashing his way round, used his driver nine times and singleputted nine times for a score that matched the Open Championship record, the record for any major championship and the course record for Turnberry. Yet despite the fact that only Seve ria no Ballesteros later in the week would come close to matching Norman's performance in much easier conditions with a 64, the big Australian ended up being just a little disappointed. Over aggression had cost him an eagle at the seventeenth and he had to make do with a birdie. At the last he needed a birdie for 61, par for 62 but what he did not know was that that 62 would have been the lowest round ever in a major. Had he known so, he might not have been so aggressive with his first putt, which went sliding three feet past. Incredibly he missed the return and the record he now admits he would have loved most of all. "I reckon a 62 will never be broken in one of the majors and I just hope I get another chance to shoot it some where along the line," he said, turning his disappointment into positive thoughts for the future. You know Greg Norman might just get another chance at that 62 and not miss out next time. He might just fire that 59 somewhere around the world because he is one of the elite few who are not scared of stringing birdies together and shooting low numbers. He loves it. . . and so do we all. His 63 on the second day of the Open paced the way for his eventual victory.. .and scores like that again in the future will ensure he lands more major titles while giving maximum pleasure to those watching him. Norman justifiably earns big money on the course and four times as much off it. His brand of aggressive golf is great for the game. Birdies and eagles draw in the crowds and Norman is the latest in the line of international stars with a remarkable gift. He reminded us of that at Turnberry that Open Championship Friday. Commentary courtesy of Renton Laidlaw. In the early afternoon of the third day a nuclear submarine nosed quietly along the shore line of Turnberry Bay. Someone playfully remarked that it had come to spirit away the Americans while no one was looking. But no rubber dinghies were seen paddling out and soon the submarine changed its bearing, heading southwest by west towards Ailsa Craig. Then it dived into the grey depths of the Firth of Clyde. It was the best place for it. A brisk southerly wind was springing up, the sky darkening and with it a strong suggestion of rain to follow that which had fallen for a time before lunch. All morning the traffic had been lined up nose-to-tail from Ayr to the north and Girvan to the south, but the crowds had come well prepared, wise to a British summer. Anoraks, waterproofs and umbrellas were going to be as essential to watching as patience was going to be to the golfers. The scoreboard told its own story. All day only one player beat 70 and that was Ho Ming Chung, of Taiwan, who had a 69. As he was out at ten minutes to nine, he was done and finished long before the leaders had even started, fortunate to have had what reasonable weather there was going. Reasonable was a word he would hardly have chosen. Ho found it "very cold and miserable out there," particularly towards the end when he dropped shots at the sixteenth and eighteenth to see a potential 67 disappear. That too was to set a pattern. Whereas on Thursday in the first round the wind had helped down the closing holes, now it hindered. The seventeenth, which had averaged 4.36 on the first day and 4.35 on the second, shot up to 5.06. And there were no eagles as compared to the ten in the previous two rounds. Conversely the seventh, which is played in the opposite direction, dropped to an average of 4.60. Scores had to be made going out, salvaged coming home. For all that, this third round was to prove marginally the easier day, as compared to Thursday, though not of course Friday. Four players this time matched par, Ian Woosnam again being one of them, which indicated his competitiveness when pitting himself against the elements. Others came from Sandy Lyle, the defending champion, Danny Edwards of America, Manuel Pinero from Spain, and David Graham, the widely experienced Australian. Others of course fared less well, the most notable victim being Greg Norman, whose two-stroke lead at the end of the second round twice advanced to five on the way to the turn but, at the end of the day, had dwindled to only one. When within sight of making his first major championship a foregone conclusion, the big Australian had taken 40 to come home. Tsuneyuki (Tommy) Nakajima, followed by an army of Japanese photographers, was on the other hand home in a highly adventurous 37 for a 71 and thereby lodged himself right on the heels of the leader. Moreover the championship was now wide open. Woosnam's 70 meant that he was now equal third instead of sixth and only three strokes behind, alongside Gordon J. Brand, who had lost a stroke on Norman with a 75. Also still in touch were Nick Faldo (76), Jose Maria Canizares (73) and the American Gary Koch (72), all sharing fifth place six strokes adrift, but less room for manoeuver from Graham, Sam Torrance (71), Raymond Floyd (73) and Bernhard Langer (76). With seven strokes to make up, something clearly exceptional was going to be needed as well as a further collapse from Norman. Among those who were definitely out of it were Jack Nicklaus, whose 76 left him hopelessly placed at now seventeen over par and sixteen strokes behind Norman, Tom Watson (77 for 225), Seve Ballesteros (73 for 224) and Lyle (70 for 221), though the latter had very nearly got himself back into contention in defence of his title. Lyle's opening rounds of 78 and 73 were hardly propitious, but when he went out in 34 and then continued steadily down the difficult homeward stretch, he began to have visions of a 68 or even perhaps a 67 which would, he felt, have given him the chance of getting up into the top four or five, if not quite winning. He was certainly one of the few players strong enough to get close enough to the seventeenth green for the birdie he knew he needed, but it was this hole that finished him. His drive did not quite hold up in the wind and it pitched on the steep bank to the left of the fairway. Moreover, it found a ghastly lie in the now wet and clinging grass, against the grain. Not even his great strength could move the ball more than two feet. Lyle's next went further, but it scooted across the fairway into more thick rough and he could only get another wedge to that recovery. His fifth shot had to be played with as much as a six iron and even that missed the green, going into the rough once again. From there he managed to get down in two, but his seven was altogether too much to bear. Perhaps the most significant aspect of Norman's round was not so much that he twice failed to build on a lead of five strokes but that he kept smiling even when he could not stop the bleeding,lI which is one of the ways the professionals have of d-escribing a succession of bogeys. It revealed an inner conndence jn hjrnseJf and a beJjef that in the end all would be well. For a time it had looked even better than that. Norman began boldly with a perfect one iron to split the opening fairway, a five iron to ten feet and a putt which just caught the edge of the hole before dropping. Better was to follow. Only one of his pars through the next three holes needed the help of a single putt and then came a second birdie with an outrageous putt from the very edge of the green at the fifth. Two under par, five ahead of the field, the Australian was once again on the march. At once he tripped. Downwind, the sixth was playing only a five iron against a one iron on the first day. But Norman may have struck the shot a shade too easily, came off it and in it went into the deep bunker on the right. From there he came out very short, which was excusable from beneath the deep face, and then putted short, which was not. His putt for a four missed and one wondered if the pressure was not getting to him again. Norman rode this double bogey implacably. A three wood and five iron was enough to get him home in two at the 528-yards seventh for a birdie and then came another at the next where an immense drive left him with only a wedge to the green. His putt for a three was nevertheless substantial. Five ahead once again. It was then that the tide, in golfing terms, began to turn. In his next ten holes, Norman had six bogeys and five pars. He was hanging on, but only just. At the ninth he was in the left rough from the tee and he could not get home in two. At the tenth he was through the green. At the twelfth he needed two drivers and was in the rough again. At the fourteenth his four iron second found more rough. At the sixteenth he drove into a bunker and had no chance of getting across the bum. And finally, at the eighteenth, not even two driver shots were long enough to reach the green in now drenching rain. Everyone of them ugly fives. "The difficulty of the rain was that you could not see," ,said Norman later, his hair still plastered flat by the downpour. "It was coming down horizontally and every time I looked up to see where I was going, it hit you in the face and stung. At the ninth and tenth I pulled the trigger too soon. Getting prepared to hit was the difficulty." A caddie at such times is essential. Even so Norman's hands slipped on the club twice, once at the twelfth and again at the fourteenth. His thoughts were centred on simply getting back in and not hurting himself with a triple or even quadruple bogey. The whole of this inward half had been played in rain and as Norman came up the last fairway he was hardly conscious of this even being the Open Championship. "Nearly everyone had gone," he said. No one could blame them. Bearing in mind the glasses he has to wear, Nakajima's 71 was the bravest of efforts, particularly under the pressure he must have felt as a Japanese golfer, though not the first, within sight of a major championship. He did it moreover despite a six at the sixteenth. Here he found the fairway with his drive, but now it needed not a pitch to the green but a two iron to clear the bum. Even that was not enough. His ball rolled back down the bank from where he had to pick out under penalty and then took three more to hole out. It was for all that a scrambling round, particularly coming home when the Japanese had no less than five single putts. Two holes stood out as an example of his ability to get something out of nothing. There may have been no more wild shot all week than Nakajima's four iron at the twelfth, careering right and coming to rest in thick rough on the wrong side of the hill that is topped by a war memorial. He had no sight of the green at all but, with one huge heave, Nakajima somehow propelled the ball up and over the mound and on to the green. It was the most audacious of strokes and then he capped it all by holing a putt ofa good five yards for his par four. Later, having been in trouble off the tee at the seventeenth, Nakajima needed as much as a three wood for his third but struck it as clean as a whistle through the wind and rain to twenty-five feet and again holed the putt, this time for a birdie. Marvellous stuff indeed, further capped with another retrieve at the last where his pitch from the rough was beautifully judged to catch the mound and bring his ball back to within five feet of the hole. Other pars had been saved at the tenth and thirteenth and for someone who admitted to feeling very excited, no one surely conquered their nerves better. As a child, Nakajima had seen pictures of the Open. Now he was right in the thick of it, with the whole of Japan, he knew, urging him on. Woosnam, of stocky build, is well equipped for bad weather. What helped, he said, was that the two-ball play at least kept everybody moving at a good pace and he was able therefore to keep warm. His only wait was on the eighteenth and furthermore, he got through the last four holes in one under par. His birdie had come at the fifteenth where a one iron came to rest only two feet from the flag. There was a pitch and single putt to save par at the sixteenth, but on the seventeenth and eighteenth the little Welshman played perfectly with two putts in each case. No one else played with such resolution over this stretch when the elements were at their most demanding. The one hole that really hurt Woosnam was the thirteenth. Another foot to the left and he would have missed the bunker off the tee. As it was he was in the sand, came out but then hit a five iron over the back of the green and took three more to get down for a six. There then followed a five at the fourteenth and those three dropped strokes undid the birdies he had had at the sixth, seventh and tenth. Even so Woosnam was delighted with his position and it bothered him not at all if the wind were to continue to blow on the last day. European golfers are as a whole more used to it than Americans, he remarked. Gordon J. Brand suffered most of his damage around the middle of the course. He took three putts for a five at the fifth and, like Norman, his partner, was in the bunker short and right at the sixth. This cost him a four against the Australian's five. Despite finding another bunker at the seventh, Brand still managed a birdie, but he could not find the green at either the ninth or tenth, which proved costly. When he did hit the green at the short eleventh, he then threeputted. This was a bad run but the unassuming Yorkshireman rallied with a whole string of pars through to the eighteenth, thanks to some solid holing out and yielded only at the last after pushing his drive. Of the Americans, Koch got himself into the most challenging position with a 72 for a share of fifth place. He has become a great supporter of the Open and loves the challenge of a British links, quite undeterred by the vagaries of the weather. Golf, he believes, has become too automatic in the States where everything is done by yardages, or tends to be. In Britain clubbing takes on a whole new dimension according to the wind and, like Nicklaus and Watson before him, he enjoys having to use his brain rather than referring to map references. Another American who might just have got himself into the picture was D.A. Weibring. His 76 included an eight at the eighteenth. Here he pulled a two-iron second into the rough and got such a bad lie that his attempted recovery with a sand wedge succeeded only in driving the ball even deeper into the long grass. Another attempt advanced him, he swore, no more than an inch and then he shanked. How easily they can all add up. Furthermore, the same hole had cost him a six in the second round. If this put Weibring out of the championship, Raymond Floyd admitted that his chances of winning the two Opens in the same year were gone too. The U.S. champion had a 73 and no luck at all. He twice missed short putts while four others looked in all the way, but still stayed out. He felt that he had played well but got absolutely nothing out of it. Briefly, little Manuel Pinero looked as if he could get into the thick of the fight, particularly when he went through the turn in 32. He had thoughts then of a 66, which would have meant one more birdie. It came at the seventeenth but what he had not bargained for were the bogeys he had at the twelfth and fourteenth and a double-bogey six at the sixteenth. He took three putts at the fourteenth when going for a birdie and another three at the sixteenth. But the damage here was more a four iron second short and left into the rough. He was in two minds over the shot and in the end fell between the two stools. The high hopes that rested on Faldo and Langer tended to fade with their 76s and it was therefore Woosnam and the elder Brand who took the greatest expectation of another home victory into the last round. But everything, no one needed telling, was going to depend on Norman. Once again the promised land was beckoning. There is a general acceptance that the modern Open Championship did not begin until 1960. The oldest championship in golf did not, to be sure, ever sink out of sight and, for those with ambition, it was very much a prize to be sought after. However, after the legendary Ben Hogan travelled to triumph at Carnoustie in 1953, the lustre of the championship dulled somewhat, particularly for those professionals pursuing their careers in the United States. Indeed, after Sam Snead won the first postwar championship at St. Andrews in 1946, there was only one other winner under the Stars and Stripes banner until 1961, and that was Hogan. In 1953 the tough little Texan had already come first in the U.S. Masters and U.S. Open before heading for the coast of Angus to make his deliberate and meticulous preparations for the Open Championship, preparations that were to prove irresistibly sound. So superior was Hogan that year that there are many who will insist that the impregnable quadrilateral - the Grand Slam - would have been his had he been able to take advantage of the jet-age travel which so many globe-trotting circuit stars take so much for granted nowadays. Hogan could not even attempt the Grand Slam because the return journey from Carnoustie took so long he was unable to make it to Birmingham, Michigan, in time to challenge winner Walter Burkemo, or anyone else for that matter, in the U.S. PGA Championship, which was then still a match-play event. Outside of Hogan the Open in the Fifties was very much a British Empire affair. Peter Thomson won four times, Arthur D'Arcy (Bobby) Locke three times, with Max Faulkner (1951) and young Gary Player (1959) also getting into the act. Then came 1960. In that year a thirty-twoyear-old out of Latrobe, Pennsylvania, burst onto the American golfing scene in a big, big way. Arnold Palmer emulated Hogan in winning both the U.S. Masters and the U.S. Open before deciding to fulfill a life-long ambition and enter the Open. As a youngster he had longed to visit the home of golf and play the links courses he had read and heard so much about but finance, or rather the lack of it, had precluded such an adventure. But in 1960 he came, he saw - and he almost conquered. Despite a storming final round of 68 he lost out by the narrowest of margins to Australia's Kel Nagle. That first Palmer Open, however, was to have a profound effect on future championships. On the way home from a rainlashed St. Andrews, Arnold vowed that he would return to Britain to win the oldest title in the game and he did so the following year at Royal Birkdale then repeated in 1962 at Troon. While his performances on the golf course were significant, it was Palmer's conduct off the course that was most telling. He never lost an opportunity, as his career took off in America hand in hand with the boom in purses and television interest, to persuade fellow American players that until they played and won in Britain they could not regard themselves as true champions or great golfers. In effect he became the greatest ambassador for the Open the Royal and Ancient Golf Club could ever have hoped to recruit. His influence was immeasurable. The facts speak for themselves. Since Palmer's first victory in 1961 there have been twenty-six Opens, seventeen of them won by Americans. Indeed, between 1961 only Bob Charles (1963), Roberto de Vicenzo (1967), Gary Player (1968 and 1974), and Tony Jacklin (1969) were able to stem the American tide until Severiano Ballesteros won at Royal Lytham in 1979. American dominance was almost total- For a long, long time the rest of the golfing world firmly believed that the U.S. tour was the strongest in the world, that American players were virtually unbeatable. The rest of the world, so to speak, were in the minor league, at least one step removed from the very best who had the benefit of playing, we were lead to believe, on the finest courses, in the finest conditions and with the added bonus of excellent practice facilities on which to sharpen and fine-tune their swings. Turnberry, 1986, proved that is no longer the case. There were only five American players in the leading twenty. Gary Koch was joint sixth, eight strokes behind Greg Norman, to be the highest-ranking American. The order of finish was instead filled by European, Australian and Japanese stars, not only major champions Bernhard Langer, Severiano Ballesteros and David Graham, but also such players as Gordon J. Brand, the runner-up to Norman by five strokes; lan Woosnam, Nick Faldo, Brian Marchbank, Christy 0'Connor, Jr., Jose-Maria Canizares, Tsuneyuki Nakajima, Anders Forsbrand and Jose-Maria Olazabal. The third day of the championship this year was memorable for the comments of two of the most respected and influential voices in the world of golf over the last couple of decades. Jack Nicklaus, who languished sixteen strokes adrift of Norman with one round to play (and finished eighteen behind), refused to join in the criticism of the tough way the course had been set up. Said Nicklaus, "Most of the criticism seems to be coming from players with high scores. These are the guys you hear com plain and maybe they should keep their mouths shut." Somewhat more outspoken was Mark McCormack. He accused several players of being "cry-babies" and suggested that certain American players were "pampered." Whether or not they were pampered crybabies is not for me to say. What is abundantly clear in the aftermath of Turnberry, 1986, is that American golf no longer sits impregnably at the top of the heap. And I do not think it is because American standards have fallen off. 1 am certain it is because non-American golfers have become better and better. They are no longer in awe of American golf. Reasons for this are not too hard to detect either. Around a decade or so ago European golfers, in particular, packed their clubs, collected a bundle of air tickets and escaped the harsh winters of Northern Europe by fleeing to any warmer clime where golf was played. They ventured to Africa, Australia, the Far East, South Africa. In doing so they were learning all the time. Learning how to cope with time zones, different foods, indifferent courses, enthusiastic but often bumbling officialdom. In short, they became better all-round players. Even in the comparatively narrow confines of the European Tour a multitude of variations had to be faced and overcome. Some weeks, say in Spain, they would play American-type courses with fast and true putting surfaces, the next on some inland course in Britain where a cold winter followed by a poor spring meant putting on greens that resembled corrugated iron. Some grumbled, groused and groaned, But on the whole they buckled down and bit the bullet. Some threw in their lot with the "major" league to further improve their technique. Ballesteros, Langer and Faldo, to name but three, crossed the Atlantic, taking with them the skills learned round the globe and proved they could win in golf's Valhalla as well as in some golfing versions of Hades. Perhaps the big turn-around came at Augusta in 1980 when the supremely-talented Ballesteros, harshly called the "Car Park Champion" following his Open success some months previously at Royal Lytham, became the first Spaniard to don the green jacket. When he won the U.S. Masters again in 1983 it was an enormous fillip to Tony Jacklin's Ryder Cup side, who came within a point of beating America on captain Jack Nicklaus' home territory in September of that year. Indeed there is a school of thought that had Bernard Gallacher not been running a temperature of more than one hundred degrees that humid final afternoon in the last singles against Tom Watson, Europe's long-awaited first win on American soil would have been achieved three years ago. The signs were there then - the second division players were on the march, hungry for promotion. In 1984 Ballesteros danced an unforgettable fandango of joy on the eighteenth green of the Old Course after holing a putt for the birdiethree he knew had earned him his second Open, having seen Tom Watson's bid for a record-equalling sixth come to grief on the road at seventeen following an over-bold approach. The Pretenders were growing in strength almost by the hour it seemed. Came the U.S. Masters in 1985, and Bernhard Langer was the first German to win. On to Royal St. George's for the Open, and Scotland's Sandy Lyie emerged as the winner. He and Langer joined Ballesteros to help Tony Jacklin's European team win the Ryder Cup. The American team had no Nicklaus or Watson but, as Lee Trevino said before the historic match at The Belfry, what he did have was a team comprised of the best twelve golfers on the tour at that time qualified to play for Uncle Sam. When the golfing circus came to Turnberry in 1986 they found the most perfectlymanicured course in recent Open history, probably the bcst-ever in fact. The rough, however, was ferocious and far too many players, it seemed to me, were at least three down as they stood on the first tee. It was certainly un-American. But, going back to 1960 and the advent of Palmer, it was that very unAmericanism that was the charm, the appeal of the Open. Over the years the Nicklauses, Watsons and Crenshaws, have not wanted watered fairways and soft, holding greens. They have looked forward eagerly to testing their skills on natural linksland, keenly anticipating the fullest examination of their abilities to overcome new challenges. By the same token, however, Turnberry 1986 was something else for non-American players as well. The yelps of anguish from Ballesteros and many others proved that the Royal and Ancient Championship Committee had not by any means come up with a course which favoured those not reared on American-style golf. And Tsuneyuki (Tommy) Nakajima, fancied by many to win until he three-putted the fifty-fifth hole from nowhere, could not find words to express his feelings after his first practice round. Not even in Japanese! Oriental golf is nothing new, despite Nakajima's run at Norman for three rounds at Turnberry. Back in 1971 at Royal Birkdale an ever-smiling Lu Liang Huan (Mr. Lu to the world) hunted Lee Trevino right to the line, and in 1985 only a drastic double-hit robbed Chen Tze Chung of the honour of becoming the first Taiwanese winner of the U.S. Open. For a long time Jumbo Oxaki and Isao Aoki led the charge of the Japanese onto the links. There can be little question that Nakajima is now the main man from the land of cars, raw fish and saki. In Japan alone Nakajima has won more than two million pounds sterling and is a genuine superstar. Had he held on to oust Norman he would, in all probability, have been awarded his country's Master of Sport honour. That is an award made only twice before, to a baseball player and a judo expert. I will not accept any arguments that Norman won only because he has been playing in the States these last few years. Like Ballesteros, Langer, Nakajima and a host of others, the 1986 champion has been a member of the "Have Clubs, Will Travel" brigade. Maybe Mark McCormack was right, maybe the current U.S. crop is pampered. Maybe they will have to broaden their horizons if they are once more to dominate. Let's wait and see. Commentary courtesy of Alister Nicol. It was midnight. The crowds had long since gone with their own particular memories of another Open Championship. The sea breeze sighed gently through the gaunt grandstands, empty except for one small group of people. They had with them the championship trophy and a bottle of champagne, and among them was Greg Norman. Between sips, he reflected on the day's events. "It just seemed the thing to do," he reflected later. "It was a magic little interlude, savouring it all again, just with a few dose friends." The police found them but let them be. They understood, not wanting to break the spell. A whole galaxy of memories danced and interchanged in Norman's mind- He had done it at last and won a major championship; moreover it was the one he would always place before all others. As an Australian and a member of the Commonwealth, Norman has viewed the Open as always enjoying a special importance that may never be attained by the U.S. Open, Masters or PGA. But for Norman it had been a long time coming. He was now thirty-one and there had begun to be doubts that he might never quite ciimb the game's highest mountains. Questions had not been asked about his game, which was invariably majestic, but about his nerve. Three times he had been close and three times he had failed. It was something of which he had been constantly reminded, though he always took it with a smile and put it down to the learning process. In the 1984 U.S. Open at Winged Foot he had scrambled like mad over the closing holes, culminating in the most outrageous four at the last where he sank a putt right across the green after hitting a long iron into a grandstand. It earned him a tie, but Fuzzy Zoeller was in a different class in the play-off. Then, earlier this year at Augusta in the U.S. Masters, Norman had come to the eighteenth hole on the last day needing a birdie to beat Jack Nicklaus. No second shot could have been more reminiscent than that other second shot at Winged Foot. It cost the Australian even a tie as he took five. But opportunity was to beckon yet again in the U.S. Open at Shinnecock Hills a month before he came to Turnben-y. This time he led, at one point by three strokes in the third round and by a shot as he waited on the first tee for the last eighteen holes to begin. Already a spectator has accused him of "choking." Norman was not amused. Nor did he choke. He just faded quietly away, for some reason quite unable to get himself motivated. All these things had played on Norman's mind, he reflected as he sat by the darkened eighteenth green at Turnberry, though now he had that inner warmth that comes with victory. He looked back twenty-four hours to when again, as in the U.S. Open, he nursed a slender one-stroke lead, this time from Tsuneyuki (Tommy) Nakajima. He remembered sitting in the dining room of the Tumberry Hotel that Saturday evening and he remembered Jack Nicklaus coming across and pulling up a chair. No man in the whole golfing world is more familiar with the turmoil he knew must be going through the Australian's stomach, and head, too, for that matter. The essence of Nicklaus's brief conversation was that he believed Norman had everything that was now needed to win, that he would win and that he (Nicklaus) could think of no one he would rather win. "Just concentrate on the pressure of your grip," he advised. "That will orchestrate your tempo." Norman was touched by the gesture, as he was, too, by other words of encouragement he received from such players as Fuzzy Zoeller, John Mahaffey and Hubert Green, who regretfully had to withdraw from the final round because of illness- That all these, who had been through this major championship mill themselves, seemed to really want him to win, was the spur. The Australian spent a fitful night but did not rise from his bed until around 9.30 a.m. He felt nervous and that worried him. He had felt nervous, too, when only a few weeks before he had faced the last round of the U.S. Open. Slowly the morning passed until the appointed hour of 2.40 p.m. That knotted feeling in Norman's stomach still persisted but that was no bad thing- It is being able to control it that matters. The club still felt good in his hands, as good as it had felt all week. His state of mind was also positive. He felt determined that Turnberry should not get the better of him. He had a genuine desire not just to win but also to break par for the four rounds; to show that it could be done. What was heartening also was that the weather had finally relented, as if to show what Turnberry could really be like. The sun had come out, the wind had dropped, and across the waters of the Firth of Clyde sprang Arran and the Mull of Kintyre in all their purple glory. This was a different, more manageable golf course and if Norman needed any proof, it came from the man who, at the beginning of the week, a good many people had expected to win. It was too late but Seve Ballesteros had finally come to life with a 64. From equal thirty-eighth place after sluggish rounds of 76, 75 and 73, Ballesteros shot up in the end to equal sixth and for the first time got a place on the leaderboard. If Norman ever needed assurance that destiny was to be on his side, it was not long in coming. Indeed it could hardly have come sooner. His main challenger had to be Nakajima, with whom he was partnered. But to extend his one-stroke lead to three at the first hole was totally unpredictable, particularly after the Japanese had split the fairway with his opening tee shot. There is more to the playing of a hole than that, however, and Nakajima then missed the green; not seriously but missing it nonetheless. All seemed well when he chipped to five or six feet but from there, quite increduously, he took three putts for a six. Norman could hardly believe his eyes, but dame fortune had not finished with him yet. At the third he bunkered his four-iron second and then holed the recovery from some twenty-five yards for a birdie- Such must have exceeded his wildest expectations as his lead increased even further. Yet even then the waters in which he sailed were not entirely smooth. A drive into the left rough at the fifth and a six iron which left him there led to a five. The short sixth he got through without mishap, which was a relief, but then he hooked again from the tee high in the dunes at the seventh. Norman admitted to feeling "jumpy" and no one was quicker to see it than his caddie, Pete Bender. There, Bender noticed, was that dreaded quickening swing rearing its head again. As Norman hacked his way back on to the fairway again. Bender drew alongside and said, "I want you to do everything at my pace. Just walk at my speed and we'll do fine." Those were words of sound advice. Norman saved his par and needed little further bidding. Out near the lighthouse he got a three at the eighth with a drive, four iron and short putt, and when he went through the ninth green beneath a grandstand, he lofted a lovely little pitch from the dropping area close enough to hole the putt. He was out in 34. An eight iron into a bunker at the eleventh led to one more bogey but that stroke was retrieved with a seven-iron second to within a yard of the flag at the fourteenth. By now Norman knew that he could hardly lose. "Even I was impressed with some of my shots" he said later without a hint of boastfulness. Drives and irons ritled atter one another and the only question was whether the Australian might establish a post-war-record winning margin. This stood at six, by Arnold Palmer at Troon in 1962 and by Johnny Miller at Royal Birkdale in 1976, The chances were there, notably at the seventeenth where, after a drive into the right rough and a wedge back onto the fairway, he struck a six iron to five feet. By now, Norman's emotions were getting the better of him. He was playing by instinct as much as anything. Norman could hardly see the hole, let alone read the putt, as he desperately tried to line it up. Not surprisingly perhaps, he missed it, having indeed to sink an even longer one coming back. At least he was able to enjoy his homecoming and, with a four at the last for an inward half of 35, he was round in 69- He had beaten par for the round but not for the championship. His total of 280 matched it and, all things considered, that may just about have been right. The right man, and a very popular one, had triumphed and while his five-stroke winning margin from Gordon J. Brand was a convincing one, there had been just one moment when a gripping finish could have been in store. The threat had in fact not come from Brand, whose second place was due in the end to the eagle putt he holed for a three at the seventeenth, but from Bernhard Langer, who tied third with lan Woosnam on 286, six strokes behind. And "come on" he certainly had when, after an outward half of 36 that had done nothing for his prospects, Langer suddenly began to fire a whole sheath of arrows at the flagsticks. Seven irons to the tenth and twelfth brought him birdie-threes, the latter coming to rest an inch from the hole, and then an eight iron to the thirteenth yielded the formality of a third birdie. So that was three threes in a row and there ought to have been a fourth at the fourteenth. Here his second shot actually hit the flagstick before glancing no more than six feet away. Had it gone in for a two, which well it might have done, the difference between rum ana Norman would have been only three strokes and that might have been very interesting. As it was, Langer failed not only to get a birdie but missed the one back as well. As with Ballesteros, the West German had reserved his best until last, which was too late. But, having now been second twice and third twice, his turn may well come. Brand played above himself to finish runnerup. Nothing in his earlier'season form had suggested it any more than had his past record. Yet he kept his nerve, particularly in the last round when he could have vanished from sight. The Yorkshireman took 39 to reach the turn with three bogeys, one double bogey (at the fifth) and only one birdie, at the sixth. His driving was all awry and it was not until the twelfth that he found the fairway from the tee. On reflection Brand thought that he might have been trying too hard. He worked out that perhaps he was not completing his backswing. But down the inward stretch he felt that he played "really well." A scrambled par at the tenth lifted his spirits and with a birdie at the twelfth they positively soared. From then on Brand was convinced that he could finish high. He did, home in 32, thanks in the end to that eagle at the seventeenth. Woosnam, after a patchy outward half, was "killed" by a run of three bogeys from the tenth. It was one of those days when he could hole nothing on the greens. He had hoped that it might be windy and it was not. Birdies at the fourteenth and seventeenth hauled him back into a tie with Langer for third place, a stroke ahead of Nick Faldo, who was as consistent as anybody on this last day. Faldo finished with a 70, his driving and long iron play delighting him. There was a bogey five at the fifth and a birdie at the eleventh. Otherwise all were pars. Such a high finish was, he felt, justification of all the hard work he had put into the re-construction of his swing. Gary Koch, with a last round of 71, had meanwhile tied Ballesteros for sixth place on 288 and he was leading American. What a contrast to 1977 when eight Americans had filled the leading places. Such is the wheel of golfing fortune as, in a final salute to Norman and the first Australian victory since Peter Thomson in 1965, Concorde dipped its wings in a low-level fly-past. The Norman Conquest, as it was all too predictably dubbed on all sides, was above all a triumph over course and conditions; a triumph which owed a great deal to a refreshing and determinedly positive attitude. As Greg Norman pointedly noted, he was not exactly without experience of winds in his native Queensland, aside altogether from his years on the European Tour. Yet the cold and damp of much of Open Championship week was a further alien dimension for one reared in Australia and now living in Florida. That was one reason why, in the sanctuary of the last afternoon, one remembered the first morning when Norman was out in the worst of the weather. The four-over-par 74 he wrested from the hostile elements was at once a signal that he would not lightly accept that this was not to be his year and the highest opening round by an eventual winner since Gary Player at Carnoustie in 1968. One recalled, too, the Saturday evening when, with almost all the field in, Norman found himself having to play the last three holes into the teeth of an idly stinging, windswept rain. He could have lost the Open then and there, but he laughed in the face of the storm. His eye fell on a lone and portly scribe, drenched to the skin despite his waterproofs. "You have to be mad to be out here," he called, good-humouredly. Despite his own increasingly unpropitious circumstances, Norman also found amusement in the plight of Graham Simmers, the R&A official with the match. Taking duty to heroic lengths. Simmers weathered the storm simply in sodden blazer and flannels. (Some years ago, an American professional had refused to accept a ruling from no less a personage than John Salvesen, because Salvesen was not visibly clad in the familiar blazer and rosette). It was painful and next-to-impossible to see ahead into the biting, horizontal rain and England's Gordon J. Brand was to exclaim afterwards, "How Greg and I hit the fairway at the seventeenth I'll never know." Using a driver for his second, not least to hold it down in the wind, Norman found, disturbingly, that he had to alter his habitual proshot ritual wherein, initially, he has only his right hand on the club as he shapes to the shot. No matter how strenuously he and his caddie, the invaluable Pete Bender, towelled the grip, it was wet again by the time he placed his left hand on the club. Accordingly, he settled into his address with both hands on the club, resolutely refusing to allow the artificial change in routine to throw him. At the conclusion of that penultimate round, Norman, wet, cold and with his lead shrivelled to but one stroke, came to the press tent. He asked ruefully if the interview could be kept relatively short. He spoke cheerfully, if graphically, of the ordeal of those finishing holes. A journalist more used to the tennis firmament marvelled anew. "These golfers," he muttered, "are a different breed." None the less, for all his philosophical acceptance that the weather was integral to the storied lore of the Open, Norman was not slow to declare that he would much prefer to see the Open with two starting points, to give to all more nearly the same conditions. But, of course, apart from other considerations, only Birkdale and Muirfield of the Open Championship links in Britain lend themselves to such a suggestion, with the tenth tee suitably adjacent to the clubhouse. Over in America, Norman observed, everyone sued everyone and there were mornings when there were more law suits in the air than golf balls. When, in Los Angeles, a burglar could tumble downstairs and successfully sue the occupant of the house he was rifling, might not a golfer who broke a wrist or tore a tendon endeavouring to get out of unreasonably high rough "have legal redress against the establishment?" Volenti non fit injuria, as they say in the caddie shed. In other words, no injustice is done to a person by an act to which he consents. In fact, Craig Stadler was to damage tendons in his left wrist at the fourteenth in the first round so badly that he played no further part in the championship after an opening twelveover-par 82. "I damned near broke my wrist in the rough," the Walrus bristled, "and I doubt if I moved the ball an inch!" However, as Michael Bonallack, Secretary of the R&A, had drily commented, when Norman's views on possible law suits were relayed to him, "We don't compel the players to have to go at the ball out of heavy rough any more than out of a bush." Still, the suspicion lingered that Bonallack might have been moved to steal a surreptitious look at the R&A's insurance cover. With regard to the rough, Bonallack never ceased to insist that it was more a circumstance of the weather than the outcome of deliberate sadistic planning. In support of that contention, Bob Jamieson, professional at Turnberry for the past quarter of a century, explained that in January, February and March, they had had rainfall of fifty-four inches which was the highest since 1947. Spring had been late and when the weather suddenly turned hot, the growth had been dramatic. In contrast, the sparse, wispy rough of the 1977 Open, which rendered the width of the fairways largely irrelevant, had originated in the comparative droughts of 1975 and 1976. Jack Nicklaus maintained that the rough at Muirfield in 1966 had been worse, that being the year when Doug Sanders at first refused to leave the clubhouse on the grounds that "there could be Apaches out there" and subsequently announced magnanimously that if they would just give him "the hay and lost ball concession," they could keep the prize money. But at Muirfield in 1966, said Nicklaus, you could weigh the percentages and choose your shot, which he did not consider to be the case at Tumberry in 1986. As Nicklaus had predicted, by the last afternoon there were many places where the rough was much less punitive because it had been flattened by the passage of the galleries but, in long years of watching, I have never seen the club twist so often in the hands of seasoned professionals, the ball coming out at weirdly contorted angles even from the like of golfers of the calibre of Raymond Floyd and Seve Ballesteros. Not even a final round of 64 softened the view of Ballesteros. "It is a good course," he reiterated, "but it was set up too severely. I hate to see the R&A following the USGA in the way they prepare a course for an Open. Over there, the fairways are softer and easier to hold, the weather mostly more predictable and consistent. The golf this past week has not been what the people came to see." The spectacle of which Ballesteros complained had included a first day on which not one of the one hundred and fifty-three players broke the par of 70 and on which the cumulative score added up to no fewer than 1,251 over par. By the end of the second round, it had all been too much for the five amateurs, none of whom escaped the guillotine. Thus the silver medal which goes to the leading amateur after seventy-two holes found no recipient. The 1977 champion, Tom Watson, who from tbp first had pointed out that the way the fair ways curved compounded what he saw as the folly of making them so narrow, promised to put his views on paper in a letter to the R&A. He was as good as his word, Bonallack brandishing that letter on the morning after the championship at the R&A press conference. In his four-page epistle, Watson was critical of the change in speed on the greens from the practice days. But again, Bonallack pointed to the part played by nature. The recent heat wave, followed by rain at the weekend, followed by the cold of much of the championship, had meant that even a greenkeeper with the skill and savvy of Turnberry's George Brown could not wholly control their pace, no matter when he cut or didn't cut, how he raised or lowered the blades. At that same conference, Alistair Low, Chairman of the Championship Committee, conceded that the fairways had possibly been too narrow, some of them at least. There were other areas, too, where they would know better next time, notably the controversial and elusive ninth fairway, which he thought would have to be built up on the right for, as Low and Bonallack agreed, from the present wonderfully picturesque tee, the hole no longer plays as the architect, Mackenzie Ross, originally conceived. The Ailsa course in its 1986 championship guise was far removed what most would have seen as Greg Norman's natural habitat, and the way he coped illustrated the greater patience which now more often tempers his natural aggression and confidence. "When I first saw Turnberry," he was to recall, "the deep rough, and those narrow, angled fairways, I thought, 'Oh my God.' But then I told myself to accept the fact that this was going to be a bogey week, that everyone was going to have them and that what would matter was not allowing a bogey to multiply into a double or triple." Way back, when Norman won the Martini at Rosemount in 1977 in what was only his second tournament in Britain, he took the club back a little on the outside and then dropped it on the inside, but now his swing is very much more on the line from start to finish. His short game, and in particular his ability to manufacture shots, is greatly improved, the use he makes of his knees seemingly giving him a much softer feel. At Turnberry his putting also generally went well, the stance open as he likes to have it, the ball addressed off the toe of his blade putter in a manner reminiscent in that respect of Bobby Locke. On the last afternoon, one never really doubted that Norman was going to win from the moment he holed his bunker shot at the third. Some have wanted to make much of the fact that those in closest pursuit at Turnberry proved incapable of sustaining any real challenge on the last round, and so Norman was never under any great pressure. That, though, was hardly his fault, and if the great names were not hard on his heels, the fact remains that they were mostly in the field and he had already left them far in his wake. Norman's win at Turnberry in succession to Sandy Lyie at Royal St. George's the previous year and Seve Ballesteros at St. Andrews in 1984 meant that no American had won the title since Tom Watson at Royal Birkdale in 1983. That minor statistic paled by comparison with the fact that whereas in 1977 at Turnberry eleven of the players who finished in the top twelve were Americans, this time there were only two, namely, Gary Koch, who was sixth equal, and Fuzzy Zoeller who was joint eighth. Gary Player had advised the R&A to take no notice of the cry-babies, and both Mark McCormack and Jack Nicklaus had referred to American players as pampered. Norman, for his part, told how he had urged the stream of players emerging on the U.S. tour from college golf scholarships to play Europe, Asia and elsewhere in the world, so that they might learn to play all the shots in a variety of conditions rather than simply target golf on immaculately conditioned courses. It would be premature to read too much into the eclipse of the Americans at Turnberry and certainly Muirfield in 1987 is likely to be much more to their taste. Nevertheless, it was interesting if nothing more that it proved the prelude to the victory on American soil of Great Britain and Ireland in the Curtis Cup which meant that of the four main Trans-Atlantic trophies, the Walker Cup, the Ryder Cup, the Curtis Cup and the PGA Cup, the Walker Cup alone now is in American hands. In spite of the improvement of golf worldwide, a strong American presence in the Open Championship is still deemed essential, which is why the R&A have to be careful that they never so Americanise their courses as to invalidate the old saw that no champion is complete until he has proved that he can win on either side of the Atlantic. Commentary courtesy of Norman Mair.